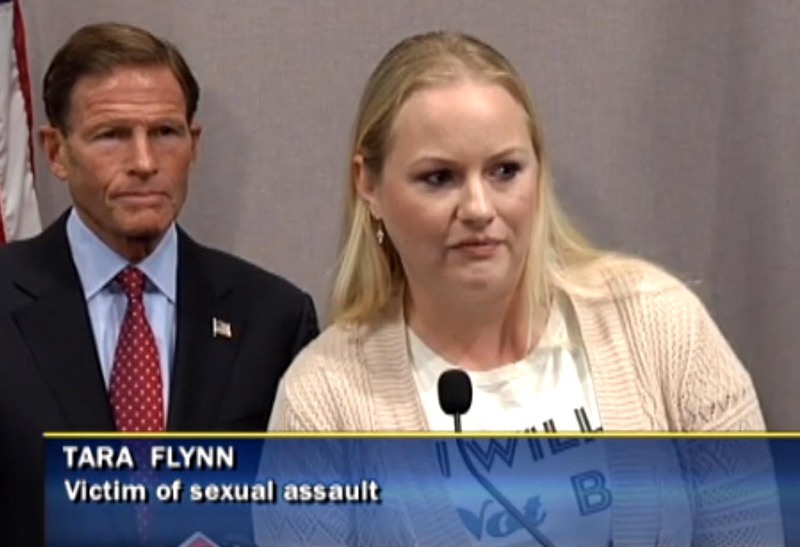 Tara Flynn spoke during a press conference with Sen. Richard Blumenthal last month. Judge Brett Kavanaugh’s contentious nomination process has shaken sexual assault survivors in Connecticut, who find themselves reliving the circumstances of their attacks and are again feeling the pain that came from disappointing efforts to find support afterwards, advocates say. The president’s disparagement of one of Kavanaugh’s accusers Tuesday night has led many survivors to believe they are better off not coming forward with allegations of sexual assault, advocates said Wednesday, and has further distressed those who have told their stories, but were not believed. “There are no words to describe how painful it is for survivors,” said Laura Cordes, the executive director of the Connecticut Alliance to Stop Sexual Violence. The alliance is a coalition of nine community-based groups in the state that counsel about 8,000 children, adolescent and adult survivors each year. At a campaign rally in Mississippi Tuesday evening, Trump mocked Christine Blasey Ford, a university professor who says Kavanaugh assaulted her at a house party when they were both teenagers, but can’t recall some of the details of the exactly where and when it happened. Trump imitated Ford being questioned at a Senate Judiciary Committee hearing last week. Cordes said Trump, and others who have attacked Kavanaugh’s accusers, are feeding into survivors’ deepest fears. Tara Flynn of Naugatuck, who says she was assaulted repeatedly by the father of children she babysat for as a teenager, said the debate over the Kavanaugh confirmation and Trump’s mocking of Ford’s testimony has frustrated her. “Sometimes I think we are taking a couple of steps backwards because it’s become so polarizing,” she said. A member of Jane Doe No More, a group of survivors who provide support and counseling to assault victims and encourage them to speak out, Flynn said the president’s remarks has moved her to work harder to help others. “It reminds me of people who didn’t believe me,” she said. Cordes criticized derisive comments about Ford’s decision to wait years before telling anyone of the alleged assault. “It’s common for a survivor to delay or never disclose the trauma they have experienced,” she said. At a press conference in Hartford last month, Lindsey Jones said she felt “pain, sadness, self doubt, guilt and fear,” after she was raped at a house party when she was in college 15 years ago. For years she told no one and convinced herself she was to blame for the assault because she had been underage and drinking. Since Ford went public with her claims, calls to sexual abuse hotlines have sharply increased. The callers are both survivors who have told their stories before and those who are making their assaults known for the first time. The National Sexual Assault Hotline reported a 147 percent increase in calls during the nine-hour Judiciary Committee hearing last Thursday, compared with a normal weekday on which sexual assault did not dominate the news. Cordes said the Connecticut Alliance to Stop Sexual Violence has experienced “a dramatic increase” in calls to its hotlines over the past two weeks. The hotline had been receiving about 185 to 200 calls a month, Cordes said, which is an increase of about 20 percent over last year that she attributed to the #MeToo movement. Cordes said the recent uptick in the volume of calls included return callers, those who are telling their stories of abuse for the first time, and family members and friends of survivors who have learned for the first time about an assault and are seeking advice on how to help their loved ones. Carisa Conway, director of the Women & Family Center, a Meriden-based organization that provides sexual assault crisis services in south central Connecticut, said her organization has also experience a recent increase in calls from abuse survivors. She said the president’s remarks about Ford’s testimony “are definitely not helping” those reaching out for help. “It takes a lot of courage to pick up the phone to us,” Conway said.